Helping Hens award $30K to local non-profits! The Toledo Mud Hens announced today that during the 2012 season, the Helping Hens Charitable Fund awarded $30,000 in grants to local nonprofit organizations, providing youth with sports and recreation services. “Helping Hens” is the official charitable fund of the Toledo Mud Hens baseball club and is administered through the Toledo Community Foundation. 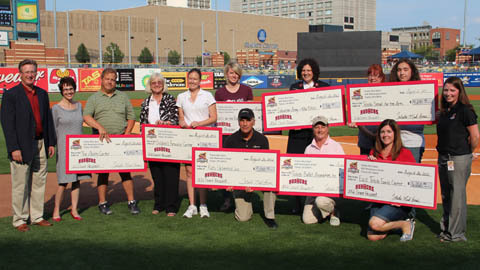 Keith Burwell, President of the Toledo Community Foundation, and Cheri Pastula, Manager of Community Relations for the Mud Hens, presented checks to the grant winners prior to the Hens game on Sunday, August 26th. “These organizations do exceptional work and the Mud Hens are thrilled to support local children in their efforts to stay active and healthy,” said Cheri Pastula, Manager of Community Relations for the Mud Hens. Ability Center of Greater Toledo – A grant was awarded to implement a bicycle education program for individuals with disabilities. Children’s Resource Center – A grant was awarded to provide a one-year membership to the Bowling Green Community Center, where children can engage in safe indoor recreation activities including soccer, volleyball and basketball. City of Fremont-Parks and Recreation Department – A grant was awarded to support the Flash Youth Running Program, which allows children to participate in Cross Country and Track & Field. East Toledo Family Center – A grant was awarded to purchase equipment that 600 children use for its baseball, soccer and basketball programming that the organization offers throughout the year. Girls on the Run of Northwest Ohio – A grant was awarded to provide scholarships for girls who cannot afford program participation fees. Kids Unlimited, Inc. – A grant was awarded to purchase playground equipment to be used by 150 children participating in its after school and summer programming. Salvation Army, NW Ohio Area Services – A grant was awarded to purchase sports equipment that will be used during the physical education module of the Bridging the Gap Program and in conjunction with activities that are sponsored by the Boys & Girls Clubs of Toledo. Toledo Ballet Association, Inc. – A grant was awarded to support the Musical Theater Camp that is conducted in partnership with the Catholic Club. Toledo School for the Arts – A grant was awarded to provide 50 underserved youth with the opportunity to participate in the Urban Dance Program. BURLINGTON, VT — Samantha Haab, from Stowe, has been announced as one of three winners of a $2,500 scholarship through the 2012 New York-Penn League Charitable Foundation Scholarship program, the NY-Penn League and Vermont Lake Monsters announced today. Haab, who graduated from Stowe High School in June, says that her first memories of Vermont Lake Monsters/ Expos games came from the Lake Monsters’ Hit the Books program, which promotes reading among kids. In addition to working with Students Helping Achieve Philanthropic Excellence (SHAPE) and the Environmental club at her school, Haab was a three sport athlete in high school. She played field hockey, ice hockey, and softball all four years of high school, being selected to Vermont’s All State second team in both ice and field hockey, and was named a captain of her softball team her senior year. Haab will be attending St. Lawrence University in New York, where she will look to major Environmental Studies/ English or Conservation Biology. Haab was honored by the Lake Monsters on Friday, August 17th before Vermont’s game with the Staten Island Yankees at historic Centennial Field. 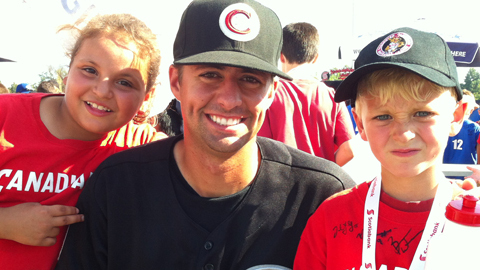 C’s RHP Bryan Longpre was game to share some cake and ice cream with members of our new Mini-League this past Friday. (Scotiabank Field at Nat Bailey Stadium – Vancouver, BC) – In partnership with the Boys and Girls Clubs of South Coast BC, the Vancouver Canadians Baseball Foundation (VCBF) has successfully concluded its first-ever mini league in North America. Based on coach feedback and player results, the mini league didn’t just teach kids about the game of baseball but also valuable life skills including self-confidence, teamwork, how to win, how to lose and how to have fun. The mini league consisted of two divisions: “T-Ball” ages 6-8 and “Coach-Pitch” ages 9-11. The Vancouver Canadians Baseball Foundation (VCBF) was founded on the vision of helping youth in need find self-confidence, hope, improved health, and a skill set that will help not just on a baseball diamond, but in life. Its programs include; the mini summer league, UBC scholarships, a premiere league event as well as additional events and fundraisers. From helping a young child onto a baseball diamond perhaps for the first time, right through to helping a bright minded student find a way to continue their post-secondary education, the Vancouver Canadians Baseball Foundation is committed to our community and to helping redefine a child’s perspective on the game of baseball. 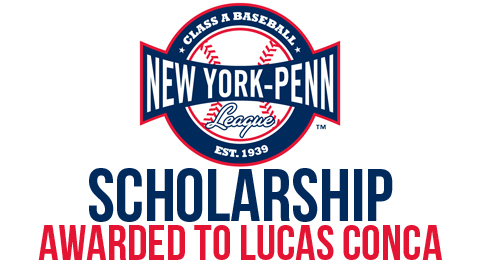 The Hudson Valley Renegades are honored to announce Lucas Conca as the winner of the NYPL Scholarship Competition in representation for the Hudson Valley Renegades organization. Conca is one of 14 finalists; one representative of each NYPL market that exemplifies the highest level of leadership, service to the community, involvement in extracurricular activities and impact on their local club. This year, Lucas graduated with honors from Our Lady of Lourdes High School in which he has received numerous awards including the “Coach’s Leadership” athletic award and “Will to Win” athletic award. He also thrives in community service as he volunteers with CFR members to benefit the feeding of around 5,000 people with every trip to the South Bronx. Lucas will be attending the University at Albany in the fall and has been accepted into the College of Nanoscale Science and Engineering, a world premier school for the cutting edge of all scientific research. On Tuesday, August 21, Renegades General Manager will conduct an on-field presentation awarding Lucas Conca $250.00 to be used toward books for his upcoming academic year. The Rome Braves and the America Red Cross announce that a Blood Drive will be held at the Three Rivers Club on Tuesday August 21st from noon until 5 p.m.
All presenting donors will receive a Free T-Shirt and 2 tickets to a Rome Braves game. Call 1-800-REDCROSS or visit redcrossblood.org and enter sponsor code RBraves to schedule an appointment. Walk ins are welcome. For more information call the Braves at 706-378-5100. (FISHKILL, NY) – The Hudson Valley Renegades will partner with celebrity personal trainer and fitness author Larysa DiDio on Sunday, August 26 to promote the health and well-being of families throughout the Hudson Valley. DiDio will conduct a 30-minute group “feel good” workout for moms, dads and families on the field following the 1 P.M. game at Dutchess Stadium. “It was a natural partnership,” said Didio. “Baseball provides the perfect medium for helping families and kids get healthier, together.” During the post-game workout, the Renegades will also conduct an on-field kickball game led by Renegades mascot, Rascal. DiDio will be available for a book signing as well as answering fans’ questions on fitness, diet and family. Book signing and meet and greet will begin at 12 P.M. and continuing throughout the game. DiDio will also take over the Renegades Facebook page on Monday, August 20 from 10 A.M. to 2 P.M to expand fitness and health education. “Fitness on the Field” will take place Sunday, August 26 as the Hudson Valley Renegades take on the Lowell Spinners at Dutchess Stadium. The first 1,000 kids will receive a Renegades backpack courtesy of New York 529 and K104. ABOUT LARYSA Larysa DiDio is a celebrity personal trainer and fitness author who inspires everyone to “Rock What They’ve Got!” Her fast, fun and efficient workouts with easy-to-follow nutrition advice have helped celebrities, Olympians, professional athletes as well as moms, dads and kids attain their health and fitness goals. She’s the author of Sneaky Fitness: How To Sneak Fitness Into Your Kids Everyday, fitness expert for SELF, FITNESS and Women’s Health magazines, was contributing editor for Parenting magazine and health ambassador for the government’s campaign to get kids fit, Best Bones Forever. Larysa has been featured in over 40 national magazines and TV showswww.larysadidio.com. Members of the Gulf Coast League Pirates, who play their games at Pirate City in Bradenton, visited the Everyday Blessings, Inc. residential facility in Sarasota Thursday. Members of the team have visited the facility several times during the last four months as part of the Pirates Community Commitment Program. EBI provides foster care to sibling groups to keep siblings from being separated while awaiting permanent placement. The Sarasota facility opened in February. The original facility is in Hillsborough County. When players visit, they eat dinner with the children and live-in caretakers at the residential facility. After dinner, the players take part in outdoor sports activities and games with the children. There are currently 12 children housed in Sarasota with EBI, ranging in age from three to 11 years old. All of the children are part of a sibling group. Emily Dutton, the Sarasota Residential Manager for EBI, said the children love it when the players come to visit. “I think they enjoy seeing there are other people in the community that understand and support them,” Dutton said. The Pirates Community Commitment Program was created in 2008 to help players in the Pirates organization give back to the communities they play in. 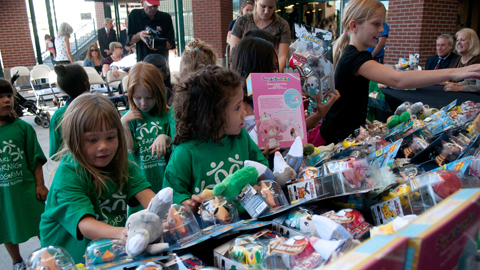 Players are required to do 10 hours of community service during the season, but most do many more. The Albuquerque Isotopes hosted 130 participants in their second of two McDonalds Youth Skills Baseball Clinics on Saturday morning at Isotopes Park. Follow an opening reception from the Isotopes team, Manager Lorenzo Bundy, hitting coach John Valentin, pitching coach Glenn Dishman, strength and conditioning coach Brandon McDaniel; pitchers Michael Antonini, Blake Johnson, Derrick Loop, Scott Rice, Will Savage; infielders Joe Becker and Alex Castellanos, and outfielders Jerry Sands and Brian Cavazos-Galvez offered one-on-one instructions to kids ages 5-15 on a variety of baseball fundamentals. The Isotopes hosted a combined total of 242 participants for both clinics. 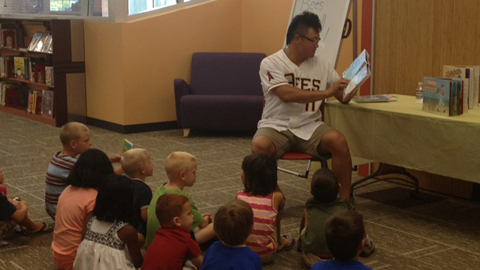 Bees catcher Hank Conger spent Thursday morning reading to children at Millcreek Library as part of a Salt Lake Bees Storytime event. Conger entertained the children while reading several books, including a story about dinosaurs playing baseball. After reading, he answered questions and signed autographs. The 24-year-old California native and Angels’ top catching prospect reiterated the importance of reading and how to make it fun. Bees players have visited libraries across the Wasatch Front during the 2012 season to help promote reading while continuing the team’s strong tradition of community involvement. 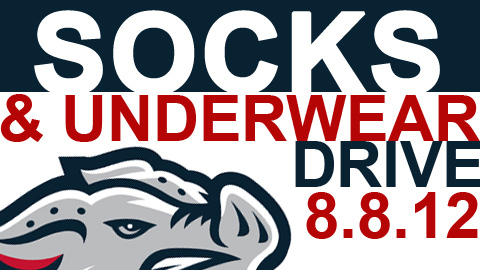 The IronPigs player’s wives are hosting the 2nd annual Sock and Underwear Drive prior to the IronPigs-Bisons game on August 8, 2012, at Coca-Cola Park. The drive will benefit the Lehigh County Conference of Churches, Allentown Rescue Mission and New Bethany Ministries. For each and every donation, fans will receive raffle tickets to win a variety of great autographed memorabilia. Receive one raffle ticket for each newly packaged pair of socks or piece of underwear donated. Raffle tickets will also be available for purchase with proceeds benefiting the Sock and Underwear Drive. Last season, more than 2,500 items were collected and an additional $4,500 was raised with each organization receiving a $1,500 donation in addition to the socks and underwear. For more information on the Drive, please contact Sarah Marten at smarten@ironpigsbaseball.com. Single-game tickets, mini plans and group tickets for all IronPigs home games presented by Capital BlueCross, are on sale now and can be purchased at the Coca-Cola Park Ticket Office, online at www.ironpigsbaseball.com or by calling (610) 841-PIGS. Bisons encourage school donations at August 3 fridaynightbash! The Buffalo Bisons announced that they will be partnering with Anthony Baldi & Associates to encourage fans “2 PACK A BACKPACK” to benefit the Boys & Girls Club of Buffalo during the team’s “Zombie Night fridaynightbash!®” against the Syracuse Chiefs on Friday, August 3 at Coca-Cola Field (7:05 p.m.). All fans that donate a backpack and/or other school supplies prior to the Bisons game on August 3 will Receive a Buy-One, Get-One Ticket Voucher that can be used at any remaining 2012 Bisons game. That includes any of the team’s remaining fridaynightbash!® games of the season: August 10, August 17 and August 24. In addition to backpacks, fans can also donate notebooks, pens, pencils, folders, calculators, erasers, glue, scissors, and numerous other school supplies. There will be several collection areas throughout the stadium. For more information, fans can visit Bisons.com or call the team at (716) 846-2211. The Bisons are holding “Zombie Night,” presented by Terror Technologies on August 3 in an attempt to set the Guinness Book of World Records for the most zombies in one place. Fans are encouraged to wear costumes to the game or take advantage of several make-up stations throughout the concourse. As customary with every fridaynightbash!® in 2012, Friday’s game will also include a pre-game “Bisons Happy Hour” (5:00 p.m. – 6:30 p.m.) with 14 oz Flying Bison craft beers for only $2 as well as post game fireworks. The Boys & Girls Clubs of Buffalo serves over 8,000 youths in Western New York every year. The “2 Pack a Backpack” initiative provides local children with school supplies that they could not normally afford. The supplies will make a great difference for thousands of children just in time for the new school year. Anthony Baldi & Associates, a financial advisory practice of Ameriprise Financial Services, Inc., is partnering with the Bisons yet again to promote this worthy cause.